An Aluminum d20 weighs in at approximately 180 grains. sorry we are not selling these before we launch the kickstarter as we need to procure a different laser to engrave the numbers correctly. start with the design your dice tab. any of our woods that are available in polyhedral form will have the opiton to order a set of polyhedrals. 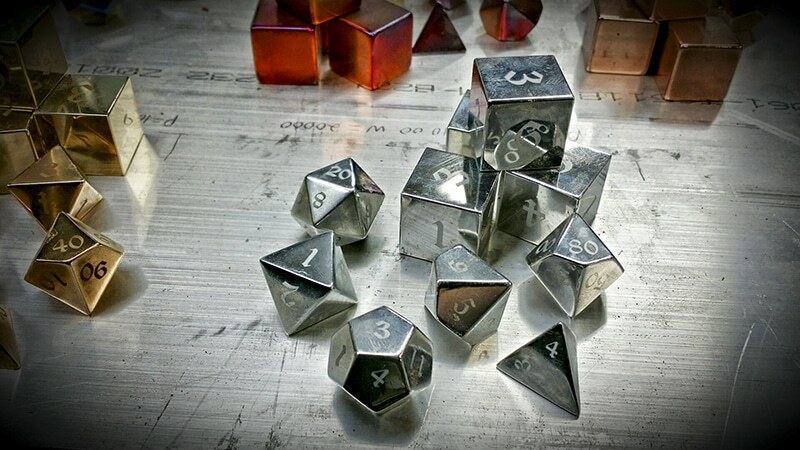 for the metal dice we’ll release the finial pricing after the kickstarter. Definitely gonna pick up a set of these when they are released. Is there an estimated timeline when the kickstarter will begin? Did you guys get enough from your kickstarter to do the Tungsten dragon’s breath dice? For the better part of a year I’ve been looking for somewhere I can get a D20 made of Tungsten and your dragon’s breath dice are extremely awesome looking. Just a heads up but “arrival” is misspelled on your “new arival” section. Great dice btw. Hope to buy from you in the near future. ah yes the players curse. while a swanky new set of dice has been known to alleviate those particular symptoms, your results may of course vary. Will these be burnished/flame colored if I get a single d20? we can do that in any metal besides aluminum. Hi!, in the image with all the dragon dice the one on the far left and bottom is a black die? which color/ material is that? :)? that is graphite, which is not on the website just yet. You can’t place an order for the dragon dice right now they are still trying to get orders out that were promised months and months ago. Looking forward to the return of these. I’m finally ready to take on a new set as a DM, and these beauties will do perfectly. 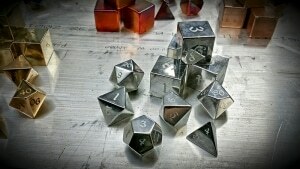 Although those graphite dice might sway my choice if they are going to be up on the site soon. How far away is it on being able to order these beautiful dice?? Any word on when these will be available again? Is there a way to be advised when the dragon collection will be available again?